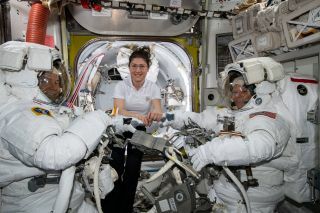 NASA astronaut Christina Koch helps colleagues Nick Hague and Anne McClain suit up for a spacewalk on March 22, 2019. NASA isn't planning to change the International Space Station's current spacesuit configuration, which drew criticism after size constraints stymied what the agency had publicized as the first spacewalk of all female astronauts. That statement came during a news conference held today (April 2) to outline NASA's plans for a spacewalk on April 8, which will be the third in a recent series of excursions. That spacewalk will be conducted by NASA astronaut Anne McClain and Canadian Space Agency astronaut David Saint-Jacques after crew assignment changes suggested by McClain after her first spacewalk on March 22. The reassignment was prompted by the fact that only one medium-size Hard Upper Torso unit is currently ready for spacewalk use, along with two large and one extra-large unit. "I think a large part of that is reflected in the complement of the crew that we have on board and what their requirements are," Kenny Todd, NASA's manager for operations and integration of the space station, said during the news conference. "At some point in the future, if we deem that based on the crew complement it's better to have things sized differently, then we'll certainly try to do that from a strategic standpoint." NASA's reassignment caused a flurry of outrage because it interfered with what would have been the first all-female spacewalk, as McClain and her colleague Christina Koch would have stepped outside the station together on March 29. Lawmakers repeatedly grilled NASA chief Jim Bridenstine on the spacesuit-sizing kerfuffle in separate hearings in recent days. And former senator and presidential candidate Hillary Clinton offered NASA some frank advice: "Make another suit." But during her first excursion, McClain decided she preferred using a medium-size unit, the same size Koch was planning to use. So she suggested NASA switch her role in the second of the trio of spacewalks with the third NASA astronaut on board, Nick Hague, who wears a large Hard Upper Torso. McClain had trained in both medium and large units before heading to the space station, which is standard practice for astronauts. "A lot of crewmembers, they can what we say upsize or downsize," Todd said. "They have a primary suit that they fit in, that they train in, but there's also some amount of training that's done in other size suits to see if those suits will work for them. That's just a standard way of doing business." Todd emphasized that the recommendation to restaff the spacewalks came from McClain herself, and not as a fallback option. "If there would have been a request to go change the HUT [Hard Upper Torso unit] or try to resize to a medium, certainly that's something we would have gone and considered, but that wasn't the request," he said. Switching out the torso units is a long and complicated process, and there was just a week between McClain's spacewalks as originally scheduled — and any additional spacesuit work would have affected time available for science and other tasks on board the orbiting laboratory. But rearranging spacesuit configurations isn't currently on NASA's to-do list, even as a low-priority task, Todd said, citing a lack of need based on current staffing of spacewalkers on the station. "We could absolutely do that, if we found ourselves requiring that. If we had no other option then to go swap out the upper torsos, we could certainly go do that," Todd said. "It's not something we do very often and we take great care when we do it, and we want to make sure that when we have to do it that we have the ample time to get it checked out."